The Osher Lifelong Learning Institute of the University of Minnesota is a unique organization dedicated to learning across the lifespan, particularly the elder end of that span. In fact it was once called the Elder Learning Institute before an endowment from the Osher family inspired a new name and a less pejorative descriptor of its members. OLLI has no age limits—you don’t have to show your AARP card or Medicaid statement to enroll. But to take advantage of most of the learning opportunities, you do need to be able to attend programs and classes during the day. Hence it is essentially an educational haven for retired Twin Citians. From a “jazz 101” class five years ago, a special interest group formed and has grown to over 80 members who are fondly known as the OLLI Cats. Led by the intrepid Joan Delich since its inception, the OLLI Cats meet monthly for a presentation about their favorite subject, usually delivered by an area jazz musician. Over the past few years we have heard Kelly Rossum talk about Miles Davis, Dave Hagedorn explain the inner workings of the vibraphone, Vicky Mountain demonstrate scatting (even getting everyone to try it out), Phil Hey describe the role of the drummer, and Mary Louise Knutson discuss the basics of rhythm and harmony. Sometimes the presenter illustrates the talk with favorite CDs, but most enjoyable of course is the opportunity to hear the artist at work, demonstrating techniques and styles, or just giving us a sampling of the music in the private, all-acoustic environment of a small auditorium. 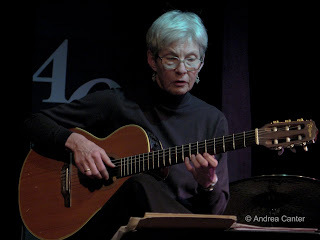 Such was our April session, a preview of new Brazil-inspired works by local guitarist/mandolinist/bassist Joan Griffith as well as arrangements of works by famed Brazilian composers. Joan and local piano star Laura Caviani have conspired in the studio on the forthcoming CD, SambaNova, and their session with the OLLI Cats included some of Joan’s new compositions as well as tunes from the likes of Jobim that helped demonstrate the most popular styles of Brazilian music. For the afternoon, Joan and Laura were joined by ace percussionist Gary Gauger. There’s nothing like a private concert, and particularly one led by the instructive and entertaining commentary of Joan Griffith. Spending more time in the classroom than club room or concert hall, Joan heads jazz studies at St. Thomas and leads ensembles at St. Kate’s and Macalester. For 20 years she has partnered with Ruth McKenzie as visiting artists in the public schools to introduce students to jazz. Her work at St Thomas has included teaching about jazz and Latin music through that university’s “senior college” program. My first experience with OLLI in 2003 was Joan’s demonstration of the basics of jazz bass, and my only encounters with the St. Thomas program have been her courses on Latin music and the history of jazz. Like any master teacher, Joan can entertain while imparting vast knowledge, but like only a small handful that I have encountered, I am fully convinced she could engage this older learner in the study of plumbing or wallpaper hanging. But on this afternoon, I was pleased to learn more about samba, bossa nova and choro. And I was particularly pleased to be among the first to hear the stunning melodies and delicate harmonies coming this fall on SambaNova. The afternoon session evolved as a sampling of the key styles of Brazilian music, starting with the basic samba. But there’s no such thing as simply samba—Joan learned that there are at least 26 variations of this popular, gently swinging rhythm, including the bossa nova. Her own “Belleview” is named after her high school and dedicated to her parents who endured listening to Getz/Gilberto for hours on end. Joan and company also demonstrated the delicate “Baiao” style of northern Brazil, what Joan referred to as “roots music” heavily tinged with a Spanish and Middle Eastern folkloric. The result is exquisite and recalls the gentle side of Granados. With a tune from Brazilian guitarist Joao Lyra, Joan and Laura (no percussion) ramped up the tempo in “Frevo” style, the fast-paced party music filled with swirling, gnarly rhythms. I have heard each of these musicians separately, and Joan and Gary together with another fine interpreter of Brazilian music, vocalist Lucia Newell. Most surprising, perhaps, was Laura Caviani, whose own compositions tend toward thick clusters of chords, bluesy melodies, and angular rhythms not unlike one of her muses, Thelonious Monk. The setting of samba and choro exposes Laura’s delicately lyrical heart—some of the most beautiful music I’ve heard from her piano. In this context, she is a simpatico foil for Joan Griffith’s elegant strings, guitar or mandolin. And Gary Gauger, with a drum kit here limited to a snare and variety of cymbals and hand percussion, created haunting and organic soundscapes that never intruded, but always painted a supportive canvas. He does not appear on the forthcoming recording, but his contributions this afternoon were pivotal. On September 21, 2008, these musicians will celebrate the release of SambaNova at the Artists Quarter in St. Paul, a perfect, intimate setting for new interpretations of Brazil’s native music. The performance will launch the new season of the Twin Cities Jazz Society’s J to Z series, and perhaps it will also launch a new appreciation for the gifts of Joan Griffith and Laura Caviani.